Canasta – game rules. 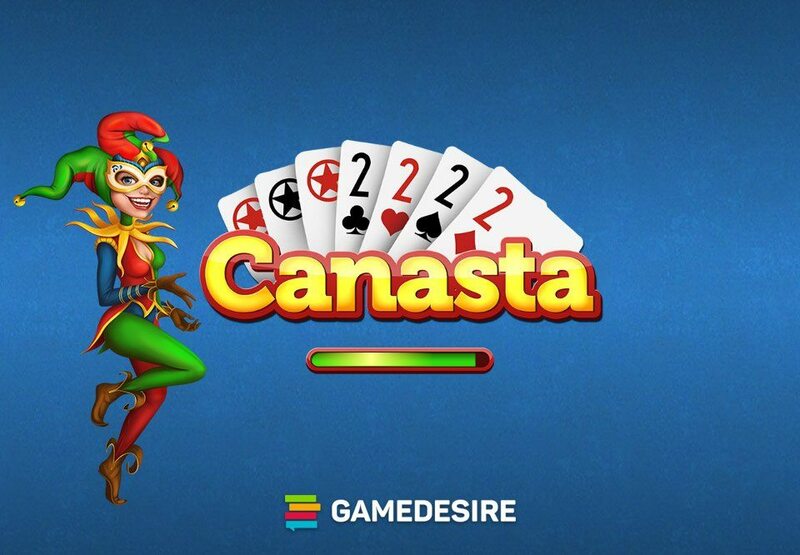 Gameplay – see how to play Canasta on GameDesire! Canasta is similar to rummy. The object of the game is to meld sets that consist of at least three cards of the same rank (eg Q♠, Q♠, Q♥). Unlike in rummy, players are not allowed to meld sequences using consecutive cards (eg. 10 ♣ J ♣ Q ♣). Canasta prototypes such as: "Comet", "Ronda", and "Manila" were already in existence in the eighteenth century. The rules for canasta were first written in 1939 in Uruguay. Its popularity then spread throughout the countries of South America, and in the 1950s, gained immense popularity in the United States. Since then, a number of variants of the game have come about. 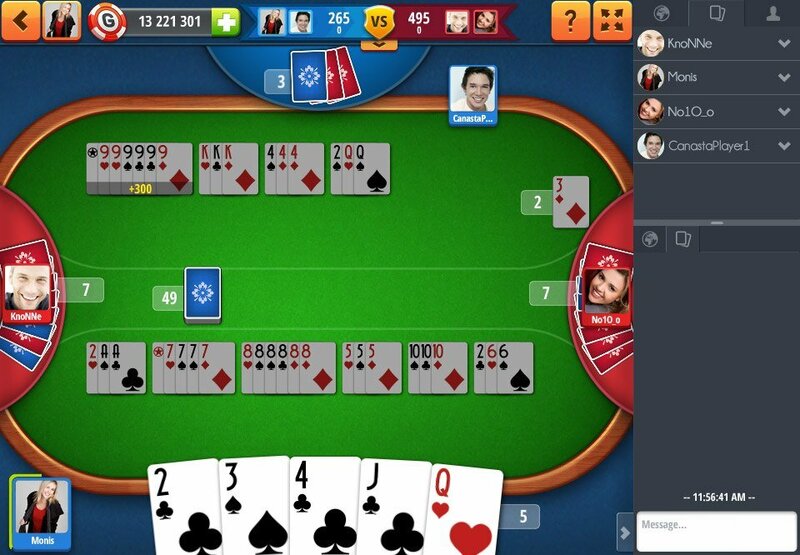 The game's biggest draw is when multiple players participate. "Canasta" in Spanish means "shopping basket". This metaphorically refers to the main goal of the game, which is to collect cards of the same rank. The game described here can be play with 2 or 4 players. With two players, the game is played "1 on 1", with four players, it's played "2 on 2". Two decks of cards that contain two jokers in each deck are used to play the game. There are 108 cards in total. The object of the game is to have the highest score possible and get rid of all your cards. The game consists of several rounds. It ends when a player or team gets 5000 points. 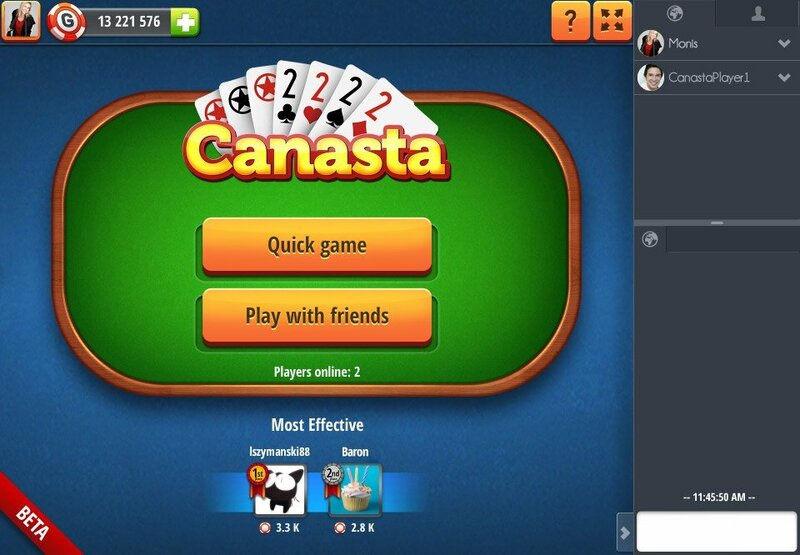 To finish the game, players must get at least one "canasta" (“2 on 2”), or at least two "canastas" (“1 on 1”). A "canasta" is a collection of at least seven cards of the same rank. It can be formed using wild cards too. To begin, each player is dealt 11 (“2 on 2”), or 15 cards (“1 on 1”). The remainder of the cards are used to form a "stock pile". The top card of the "stock pile" is then used to make the "discard pile". First, the starting player draws one card from the "stock pile" or, (in special conditions) from the "discard pile". Then, if he/she can and wants to, he/she melds. After that, one card (potentially less useful) must be discarded and that round ends. 15 – if the player/team has negative points. After the first meld, the main components of the game involve drawing, melding and discarding. In "1 on 1”, each player has their own melds and adds cards only to them. In "2 on 2”, partners work together – they can add cards to those melded by their partner. The player/team cannot meld two melds using cards of the same rank. For every card melded, a player receives positive points. Additional points can be gained too. Negative points are also a possibility during the game. 7, 6, 5, 4, black threes – 5 points. Melding all the cards in the initial meld and getting bonus points is possible if there is a "canasta" among them. This is an exception and it can happen when the minimum initial meld value requirement is not made. 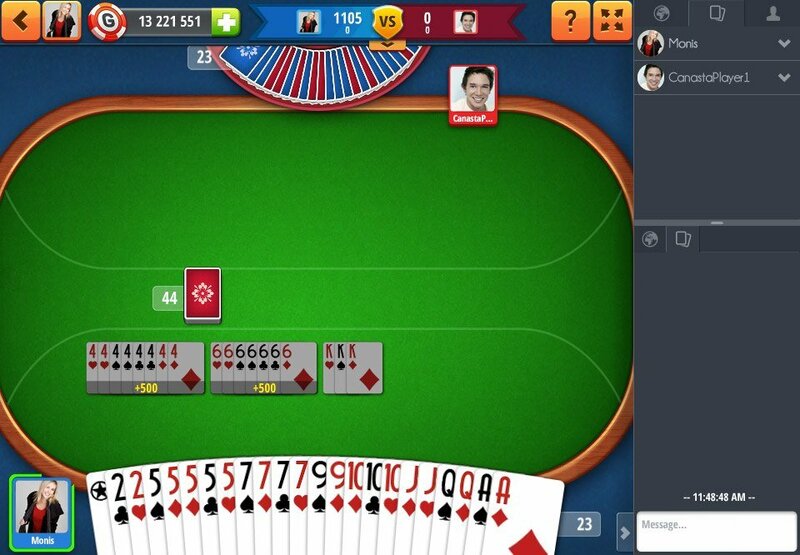 In this case, a player can meld all their cards with or without a final discard. If a player draws a card from the discard pile, they must meld all the cards from the pile in that same turn. Threes are considered to be "special cards". Black threes cannot be melded in the standard way. Three or four black threes can be melded only during a player/team's turn, which then ends the deal. They are worth 5 points each. If a player discards a black three, no one is allowed to draw from the discard pile for the rest of the round and it is "blocked". If at the end of the deal, a player/team still has black threes in their hands, they get 100 negative points. Red threes are bonus cards. If a player draws from the 'stock pile' or is dealt a red three, it is immediately displayed so the other players can see it and another card is automatically taken from the "stock pile" to replace it. If a player/team draws a red three from the "discard pile", it is immediately displayed, but the player/team does not take another card to replace. Occasionally, it might happen that a red three is the top card of the discard pile at the beginning of the game. In this case, the discard pile is frozen. There are special cards, called "wild cards", that can replace any other card. Canastas with wild cards are called "unclear", "black", or "mixed". Of course, it is possible to make a "clean" canasta "dirty" – by adding to it a wild card. Melds consist of at least three cards. At least two of them must be natural cards (from Ace to four). There should never be more wild cards than natural cards and never more wild cards than three. "Wild" canasta consists entirely of wild cards. They are worth 2000 points. "Wild" canasta must be melded in one turn. The number of cards in the "discard pile" is known to the players but only the top card is visible. The discard pile is blocked if there is a black three on top of it. Players cannot “buy” it now. But if another (natural) card is discarded on top of the black three, the pile is unblocked. The discard pile is frozen if there is a "wild" card or a red three on top of it. These cards are placed crosswise on the pile and when they are on the top of it, no one can “buy” them. Once another 'natural' card is played on top of the 'wild' or red three, the pile can be “bought”. However, this can only be done if the player has two natural cards of the same rank as the top card. They then have to be melded immediately. After melding, the player can draw other cards from the "discard pile". The winner is the player who reaches a score of 5000 points first. The points are always added up after each deal, but not during it. The deal is finished if one of the players gets rid of all their cards and has completed the required numbers of canastas. There is one special case when a canasta is not needed to finish the game – when the "stock pile" runs out. In this case, the game ends automatically. Negative and positive points are added up after each deal.